We've combined ratings from an independent financial review service with customer reviews in order to rank the best scooter and moped insurers. You can compare prices and cover levels using a comparison website like GoCompare.com and find out about the average cost of moped insurance here. If you're interested in motorcycle insurance click here. We've compiled our list of the top moped insurers based on the customer scores from websites such as Reviews.co.uk, Reviewcentre.com and Trustpilot. Customers rate providers based on their reliability, trustworthiness and claims handling process. We then combined this with the ratings of an independent financial review service that rates policies based on the comprehensiveness of their features. This method means both the quality of the product and the customer experience are taken into account. Other companies such as Suzuki score well with financial service review firms but have been excluded from our list as they are specialist services for specific moped makes. What makes a good moped policy? Do I need moped insurance? Just like car insurance, moped insurance is a legal requirement. Even if your moped is being kept off the road you'll need insurance, unless you have a Statutory Off Road Notification with the DVLA. By law, you need at least third party insurance. This can cover you for any damage you to do a third party or their belongings, but will not cover you for your own costs. A third party, fire and theft policy can also cover you if your moped or scooter is stolen or damaged due to a fire. Insurers will usually also offer comprehensive moped cover. This can cover any costs to your scooter or moped along with third party insurance. Some also offer things like legal expenses and personal accident cover. The average cost of moped insurance in the UK is £279 per year. Bear in mind that the type of policy - third-party, third-party, fire and theft, or comprehensive - will make a difference to the price of the premium. The cost of insurance will decrease the more experience you have. For instance, a 25-year-old can expect their 50cc moped insurance to be cheaper than a 16-year-old's. Remember that the cost of your insurance will depend on a range of factors, including what vehicle you have, your age, your experience, where you live and the type of policy you opt for. Sometimes you can lower the cost of your moped or scooter insurance premium. 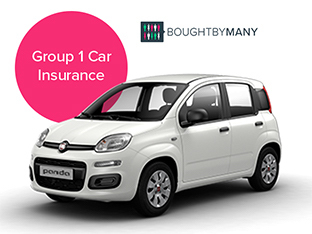 If your vehicle is secured well (by using things like alarms and immobilisers) insurers may offer a cheaper premium. Some insurers allow you to set your excess. Opting for a higher excess can bring your insurance premium down. However, remember that if you do have to make a claim, you will have to pay the excess, so make sure it is affordable. 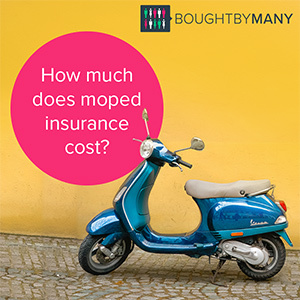 For more information, check out our article on the cost of moped insurance. What makes a good moped insurance policy? A good moped or scooter insurance quote will vary depending on your circumstances and the type of policy you require. It's worth remembering that if you are riding your moped on CBT with L plates, you may not be able to ride under certain circumstances (abroad in most countries, for instance). Make sure the policy you opt for is right for you, and that you read the policy documents so you know exactly what's included. If you're moving on from the moped to a more powerful bike, why not check out our article on the best motorbike insurers?